Back in 2007, the federal government mandated that light bulb manufacturers start to move away from incandescent bulbs to energy efficient bulbs. Now, 12 years later, LED bulbs have dropped dramatically in price. LED bulbs use tiny amounts of electricity, come in all sizes and shapes, and are catching on everywhere. 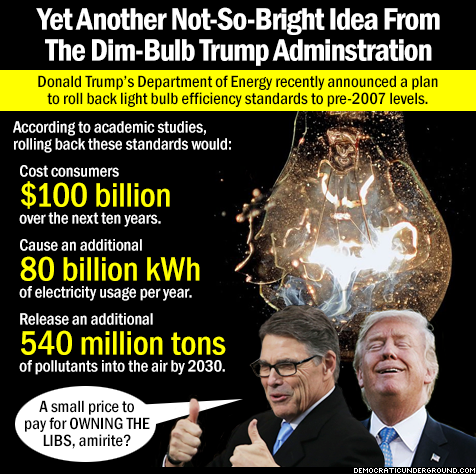 Everywhere that is except in the minds of the dimwits who make up the Trump administration — which now proposes to roll back light builb standards and return us to the day of energy burning incandescent bulbs. Fortunately, the industry and consumers are much smarter than the Trumpsters. Previous Post One characteristic of Very Stupid People . . .